Vice Adm. (ret) Adam M. Robinson is a native of Louisville, Ky. He entered the naval service in 1977 and holds a Doctor of Medicine degree from the Indiana University School of Medicine, Indianapolis. Following completion of his surgical internship at Southern Illinois University School of Medicine, Springfield, he was commissioned. Robinson’s first assignment was as a general medical officer, Branch Medical Clinic, Fort Allen, Puerto Rico, before reporting to the National Naval Medical Center, Bethesda, Md., in 1978 to complete a residency in general surgery.] His subsequent duty assignments included: staff surgeon, U.S. Naval Hospital, Yokosuka, Japan, and ship’s surgeon, USS Midway (CV 41). After completing a fellowship in colon and rectal surgery at Carle Foundation Hospital, University of Illinois School of Medicine Affiliated, Champaign-Urbana (1984-85), Robinson reported to the National Naval Medical Center, Bethesda, as the head of the Colon and Rectal Surgery Division. While there, he was called to temporary duty in 1987 as ship’s surgeon in USS John F. Kennedy (CV 67) and in 1988 as ship’s surgeon in USS Coral Sea (CV 43). Robinson reported to Naval Medical Center Portsmouth, Va., in 1990 as the head of the General Surgery Department and director of General Surgery Residency Program. He was appointed acting medical director for the facility in 1994. [While at Naval Medical Center Portsmouth, Robinson earned a Master’s degree in Business Administration from the University of South Florida. In 1995, Robinson reported to the commander, Naval Surface Force, U.S. Atlantic Fleet, as the force medical officer serving in that capacity for two years. Following that assignment, he reported to Naval Hospital Jacksonville in 1997 as the executive officer. In January 1999, as Fleet Hospital Jacksonville commanding officer, Robinson commanded a detachment of the fleet hospital as a medical contingent to Joint Task Force Haiti (Operation New Horizon/Uphold Democracy). In August 1999, Robinson reported to the Bureau of Medicine and Surgery (BUMED) as the director of Readiness and was selected as the principal director, Clinical and Program Policy in the Office of the Assistant Secretary of Defense for Health Affairs in September 2000, where he also served as the acting deputy assistant secretary of Defense for Health Affairs, Clinical and Program Policy. Robinson was assigned as commanding officer U.S. Naval Hospital Yokosuka from September 2001 to January 2004, after which he received assignment back to BUMED as deputy chief of BUMED for Medical Support Operations with additional duty as acting chief of the Medical Corps. In July 2004, Robinson reported as commander, National Naval Medical Center, Bethesda, Md. He assumed the duties as commander, Navy Medicine National Capital Area Region in October 2005. 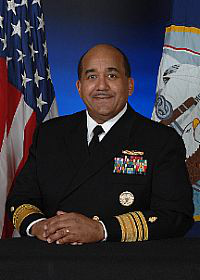 Finally, he served as the 36th surgeon general of the Navy and chief of the Navy’s Bureau of Medicine and Surgery. The author of numerous presentations and publications, Robinson holds fellowships in the American College of Surgeons and the American Society of Colon and Rectal Surgery. He is a member of the Le Societe Internationale de Chirurgie, the Society of Black Academic Surgeons, and the National Business School Scholastic Society, Beta Gamma Sigma. He holds certification as a certified physician executive from the American College of Physician Executives. Robinson’s personal decorations include the Distinguished Service Medal (two awards), Legion of Merit (two awards), Defense Meritorious Service Medal (two awards), Meritorious Service Medal (three awards), Navy Commendation Medal, Joint Service Achievement Medal, Navy Achievement Medal and various service & campaign awards. He retired from active duty in November 2011 after 34 years of service. This award serves to honor the supreme dedication to military medicine through improvements at the highest level of Navy Medicine & awarded to the 1st place winner in basic science category at this 2nd annual Society of Military Surgeons symposium.